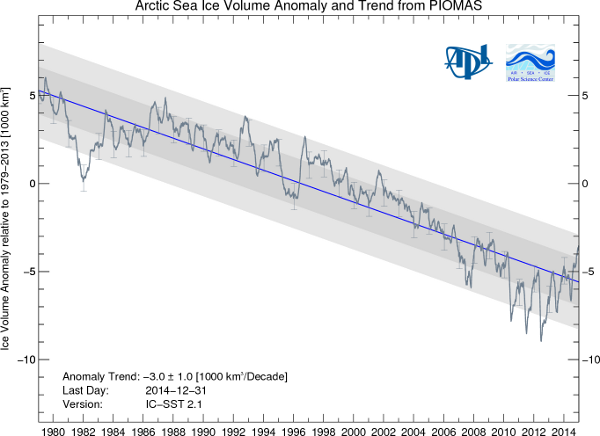 Arctic sea ice has been on a long downwards trend and this is projected to continue. There are various ways to measure sea ice. 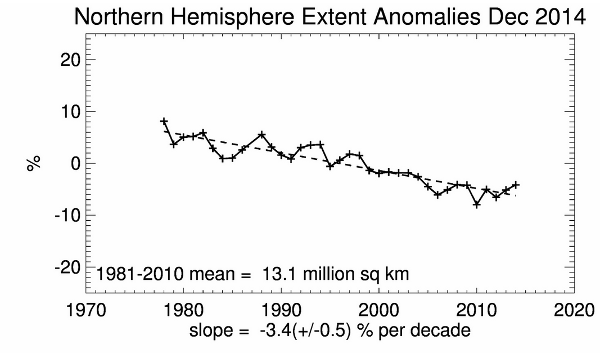 Sea Ice extent gives you the area of ice that varies between Summer and winter peaks. It is on a long downward trend. It is relatively easy to measure by satellite remote sensing. Ice volume is a much better measure of sea ice, but it is notoriously difficult to estimate with accuracy, involving people doing actual thickness measurements which involves travel by helicopter or submarine and then estimation. The relative age of sea ice in the Arctic, and the extent of different aged sea ice, provides an intermediary method for gauging the state of sea ice. This can be done through remote sensing, although it is not without it's own measurement problems and level of inaccuracy. NASA has now produced this 1 minute video showing that old ice is now exceedingly rare. This affects the thickness of ice and the susceptibility to melting with summer. 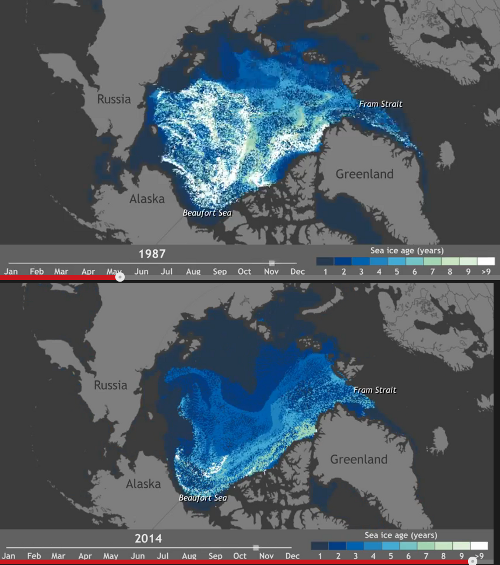 The animation tracks the various levels of different aged ice from 1987 to November 2014. Each winter most of the Arctic sea freezes over and forms new ice. As winter recedes, sea ice melts and some gets pushed through the Fram Strait. This ice loss used to be replaced by new sea ice formed in the Beaufort Gyre, northeast of Alaska. But this century with warmer waters near Alaska less ice has been able to form to replace that lost through the Fram Strait. Old ice 9 years or more is now exceedingly rare. "While perennial ice increased between 2013 and 2014, the long-term trend continues to be downward, the Report Card authors stated. In 1980s, the oldest ice (fourth-year ice and older) comprised 26 percent of the ice pack; as of March 2014, it was 10%. And as the animation above shows, very old ice (say, 7-8 years or older) has become even more rare." says the NASA article.